This pattern was originally released as a mystery knit-a-long, inspired by the Movie, Frozen, and the TV show, Once Upon a Time. The puffy and textured star stitch look a bit like snowflakes, which is perfect for Frozen! 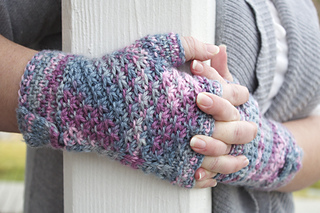 It is paired with a simple slipped stitch pattern that is great for breaking up pooling that can happen with hand dyed yarn. 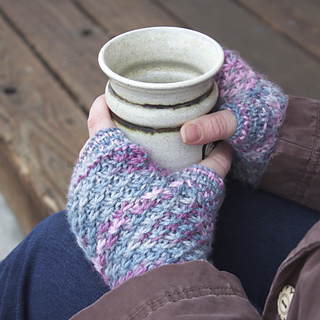 Knit in worsted weight wool, this set is perfect for keeping your neck and hands warm during the cool winter months! 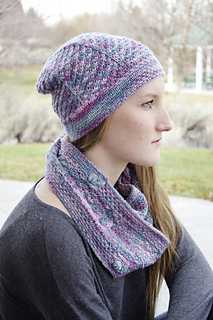 Also pictured, is the coordinating Frozen Hat, which is available separately on Ravelry. 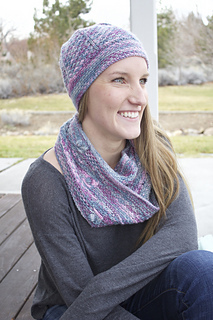 If you have already purchased this pattern, it will be 50% off. Just add it to your cart and the discount will be applied! JBW Lorna’s Laces Shepherd Worsted October ’14 - Frozen Upon a Time. 18 stitches and 24 rows = 4 inches in stockinette stitch, after blocking. 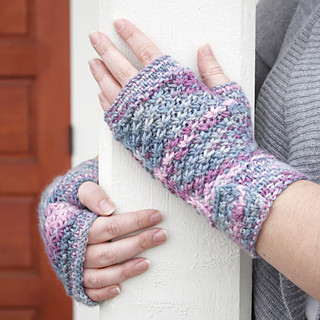 Fingerless Mitts: To fit wrist circumference 6” (7”). Cowl: 48” in circumference x 7” in width. count will be applied!